Translated by Borderland Beat reader "Jaqui" who translated the story and sent it to BB. The Federal Government has not only failed in its strategy against violence in the country, the proceeds of crime and drug trafficking also continues and its effort to conceal information about the damage and blood letting continues unabated. The willful deaths so far in six years of Enrique Peña Nieto's term ( less than four years) are incalculable. There is a feeble -and refutable- attempt by the Federal Government for counting the numbers as one of the leading causes of deaths in the country. 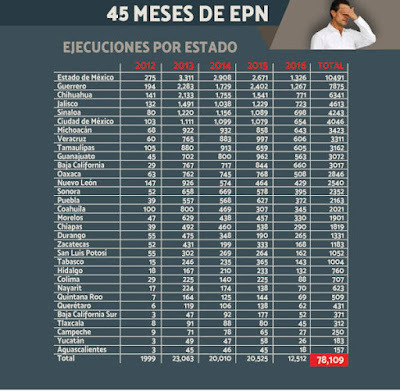 Alone, official figures from the Interior Ministry are scandalous: 63,816 court records are related to violent deaths so far during this PRI government. Of course, it was not a relevant topic in the Fourth Presidential Report. 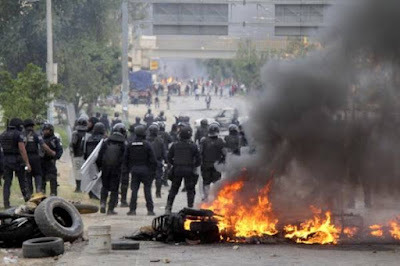 Despite the possibility of establishing a number of victims for the crime of homicide, Mexico is far from knowing precisely the number of lives lost as a result of violence and insecurity. The government covers up the obvious, the violence and the absence of a plan to combat crime, promote security or seek justice. If the three completed years (2013, 2014 and 2015) in which Peña Nieto leads the government, on average, every year 21,199 intentional homicides have been accounted for. However, the country of death was not reflected in the Fourth Report of the Government of Peña. To hide and disguise the atmosphere of war and the loss of the rule of law does not prevent the bloody reality that shakes the country. The dead are more than numbers. 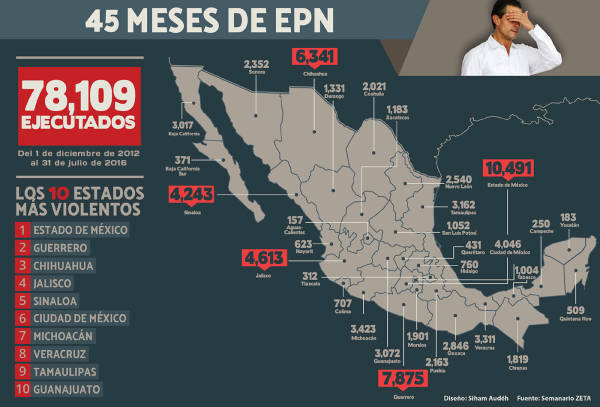 Research conducted for weeks by ZETA tallies the number: 78, 109 intentional homicides during PRI government. These numbers are the result of the number of casualties recorded by the National Institute of Statistics and Geography (INEGI), the approved reports of entities, consultations with prosecutors or state prosecution offices and some references of the Executive Secretariat of the National System of Public Security, Secretariat of Interior. However, the figure could be higher. The uncertainty of the exact amount is born mainly by the number of missing persons, homicides that are wrongfully classified as suicides in several states, and the lack of authority in some areas dominated by armed groups, where executions are committed without the presence of police forces or the possibility of justice to come. The more than 78,000 documented intentional homicides are perhaps only part of the face of death and crime that the government intends not to recognize. In this note , is the list of those executed with a firearm or knife wounds during the peñista mandate. As shown, the most violent states based on the highest number of executed are: State of Mexico, Guerrero, Chihuahua, Jalisco, Sinaloa, Mexico City, Michoacan, Veracruz and Tamaulipas. Regarding Morelos, Alberto Capella Ibarra, Commissioner of Public Security, said in an interview that the data that the Unified Command are " virtually the same " to those registered by the National Executive Secretary of the SEGOB, because "there is already a statistical system that is fed month to month. We are transparent and handle what is ". One explanation of the Commission is not in vain, but the distrust of official versions is more than normal. For example, figures that the Executive Secretary of the National System of Public Security of the Interior Ministry has documented since 1997 refer to the "crime rate", that is, the inquiries from murders and not the number of victims, although lately he has begun to generate this job. Showing the above mentioned sample of the figures -both of official crime rate between SEGOB and the handling of the data concerning homicide deaths of INEGI. In 2013, the Secretary reported the incidence of 18 ,332, while INEGI realized 23, 063 victims. The same in 2014, when the first documented 15, 653 and the second 20,010 . 2015 was no exception: 17,028 cases by SEGOB and 20, 525 by the National Institute of Statistics and Geography. Dr. Hiram Sanchez Beltran is a researcher at the University of California, Los Angeles who published an article in January 2016 on the impact of homicides in the life expectancy of Mexicans. "The problem we have in Mexico with the murder rate is that there is a constant struggle to know if the information (official) is appropriate and whether they are codifying well, or are masking information." However, the current reality is that in the country "the impact on life expectancy is much lower than it should be, because we know that there are deaths that are classified differently, even though they were actually murders". When comparing the findings of the study with the current situation, Beltran Sanchez observes how violence went from being focused in some states-most in the north- to a more widespread geographic distribution. "When we talk about the murders as an epidemic we refer to how this pattern is changing. If we look at the latest information, the data shows that the violence has spread virtually throughout the country. " For example, in 2010, entities / states such as Colima and Zacatecas have figures that were so low that they were not even considered among the states with the highest figures. " Now, Colima has a higher rate than Guerrero" he says. Hence, the expert refers to the importance of obtaining more accurate information to learn about the phenomenon and stop it. Ismael Urzua Camelo, a former assistant attorney in Aguascalientes and former official of the SEGOB, also knows the exact numbers are difficult to know. But the "deductions" are much easier. Above all , from the element of " the findings that PGR has made about organized crime in an entity or region, are reflected in terms of homicide. If there are many findings , about 15 or 20 done by organized crime, we suppose there to be an increase in homicides " he says. The now adviser to the Senate asks the question: "Why do the killings remain static, at their level, if there is a lot of organized crime? Because what happens is that crime kills and relatives and /or family are scared to death, they no longer complain, they do not want to know anything. " Besides that "when someone was wounded then dies, the authority does not update the information, the investigation itself, yes, but the statistics do not reflect an updated high," he concludes. Roel Santiago, director of the civic organization Semaphore , says crime increased 17% in intentional homicides in the first half of 2016 compared to the same period in 2015, and it is a result of disputes between the cartels. However, the consultant who created the mechanism for measuring crime rate, which is qualified with green, yellow or red, depending on the security situation in the country and in each entity, also seen in the use of police forces to combat drugs, is the background of the problem.
" 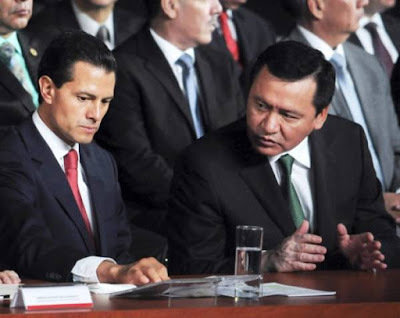 The current administration does not want to adopt a change in drug policy for fear of paying the price in 2018, and continues to suffer the political cost of insecurity throughout Mexico," he said. In an interview with this Semanario, the specialist points out that while in 2015 Semaphore information - fed at the time by Lantia Consultants - indicated an average of 677 executions by organized crime per month , by July 2016 , 1,080 homicides were related with organized crime. 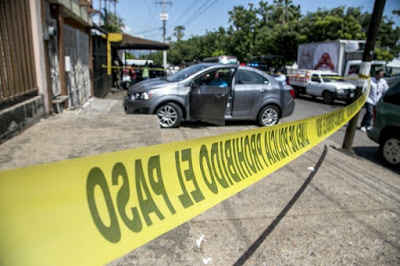 "In the first half of the year, 56 percent of homicides in Mexico were executions of organized crime, but there are states where this figure is above 80 percent, as Guerrero, Colima and Tamaulipas" he says. Roel relates the constant increases in crime rates in those states with the presence of two to four criminal groups in competition for the plaza. A report from the firm specializing in security , Stratfor , entitled " The Cartels in Mexico Erode in 2016 ", projected to continue the trend of fragmentation of the cartels, some of which have been maintained for over 20 years. Such divisions occur within the same criminal organizations, mainly the Sinaloa Cartel, Los Zetas and Jalisco New Generation Cartel (CJNG). "No criminal group will remain immune to decentralization and reduction," says the report. It is precisely in the strategy to combat drug trafficking, where Santiago Roel sees the main problem with the Mexican government, as the drug policy "gives market power to the mafias, this leads us not only to high impact violence , but high impact corruption where the authorities could collapse with silver or lead, "he says.
" After more than nine years with this strategy of increasing violence in the war against drugs, when all indicators are pathetically negative, why so stubbornly stay in a strategy that does not work? Neither protects us from consumption (drugs ) or achieves peace, "he exclaims through his phone. The dead will never be counted. In different states, those killed will never even go past the desktop of an authority. Chiapas is one of the states that has been rated as the safest by the National Security Council, however, it is far from it. Pepe Gallegos, editor of The Herald , explains that in recent years, "drug trafficking and treatment of people continue to invade the crime pages and /or red notes of major newspapers, who discreetly have tried to minimize the facts for fear of reprisals from different cartels ", thanks to the absence of authority. 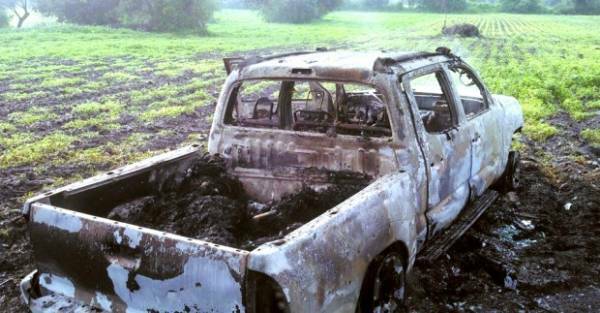 The journalist cites some cases, such as Ocozocoautla de Espinoza, "a place where there is present an armed group called the Cartel de los Sapos, where there has appeared corpses in out of the way places , some of them even collected by the government." One more. 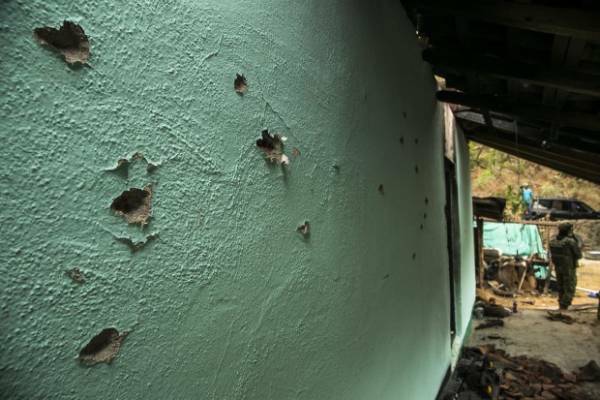 In Chamula there was talk of a clash where there were at least seven killed in a firefight, but the same indigenous inhabitants did not let the police or justice departments enter . 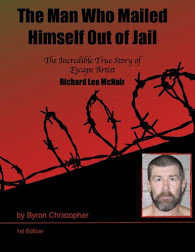 The clearest example , he continues , was that of a woman who allegedly committed suicide by putting her head in a bag of nylon with a tie and then threw herself to a cistern, where she was found; that same day the body of another person was found with signs of torture, mutilation and burned arms in a tourist place ". Something similar happened in the state capital a couple of weeks ago. A businessman with bars and clubs , in addition to a car repair shop, was found dead in his car, but according to the state attorney general this was another suicide. A statement from the PGJE of Chiapas confirmed the man's death was caused by a tourniquet to strangle himself by the neck with a rope and a screwdriver. Drug trafficking and its consequences, the omission of a government without strategy and unrealistic figures make for a country sinking in drug trafficking, violence and corruption . And what does the President has to say about that? What a smart loser! I thinking it's over 100000, I don't believe the lying Mexican government! Wow this chart is amazing.One can gleen a lot of info from them.Look at Quintana Roo in 2012 and now and Colima and Baja Sur.In a nutshell you can see crime spreading all over Mexico,very few relatively safe places left but the vacuums will fill there too.Every square inch that the criminals can get.Sad but true. And nearly NO US press coverage of our nearest neighbor, especially regarding the innocent people that have to live in what has literally become a war zone. And to think some folks glorify the narco culture, heartbreaking.